Each spring as the sun comes up over the polar regions, the seasonal frosts that have accumulated there during winter begin to sublime away. 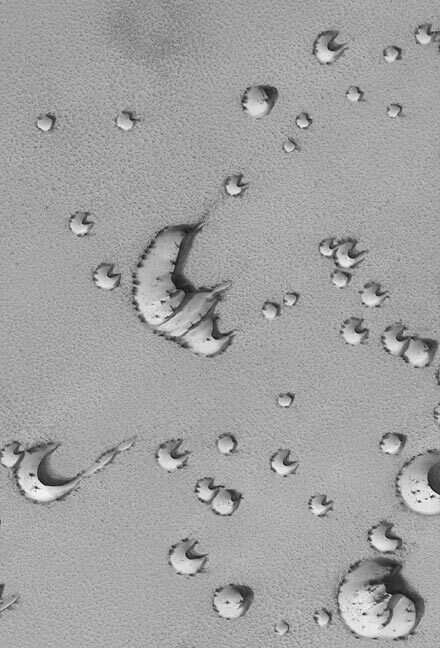 Dunes are among the first features to show spots and streaks resulting from the defrosting process. Unknown is whether the dark spots and streaks are sand (from the dune) that has been mobilized by wind, or frost that has become disrupted and coarse-grained (coarse grains of ice can look darker than fine grains). This Mars Global Surveyor (MGS) Mars Orbiter Camera (MOC) image shows north polar dunes near 76.6°N, 255.9°W in early spring. The image, acquired in June 2002, is 3 km (1.9 mi) across. Sunlight illuminates the scene from the lower left.